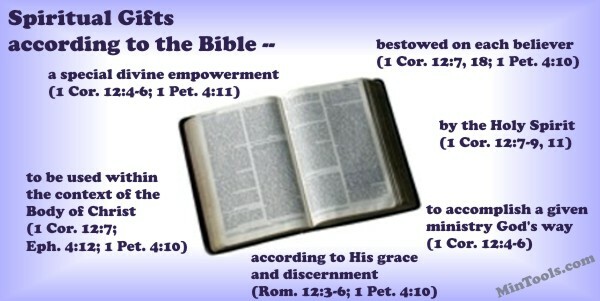 Criteria for Defining the term "Spiritual Gifts"
God will never contradict Himself. His precepts, His plan through the ages, and the precedence seen in scriptural examples all need to be taken into consideration. Definitions must concur with the whole of who God is and not just the parts we like. Key passages include Romans 12, 1 Corinthians 12-14, and Ephesians 4. Definitions must be consistent with God's Word and not just fit our experience. Often an examination of the original language of the Bible adds to our understanding. Definitions must be congruent with God's original intent and not be based on our own understanding. Although Scripture does not define what a spiritual gift is, the Bible teaches enough on this subject to draw an adequate conclusion. When you operate within this definition, you will see the church grow as each member does his/her part according to the Holy Spirit's work following God's design and purpose. Ephesians 4:16 reads . . .
From Him the whole body, joined and held together by every supporting ligament grows and builds itself up in love, as each part does its work. Expand your understanding of this definition with this definition.